My Easter treat for this year is a couple of giant Kinder Surprise eggs. Look at how big they are! It’s shown here with a regular sized Kinder Surprise Egg for scale and a Mini Kinder Egg which I added because I happened to find them in a local shop. 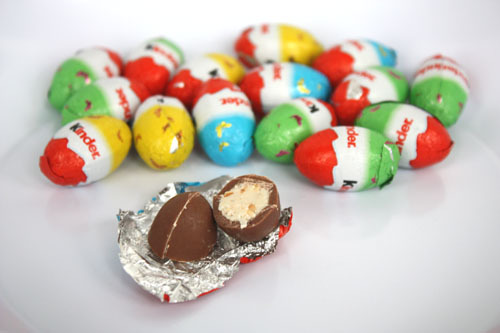 The Mini Kinder Eggs are filed with hazelnut paste and bits of hazelnut. They are delicious and I recommend you grab some if you see them. 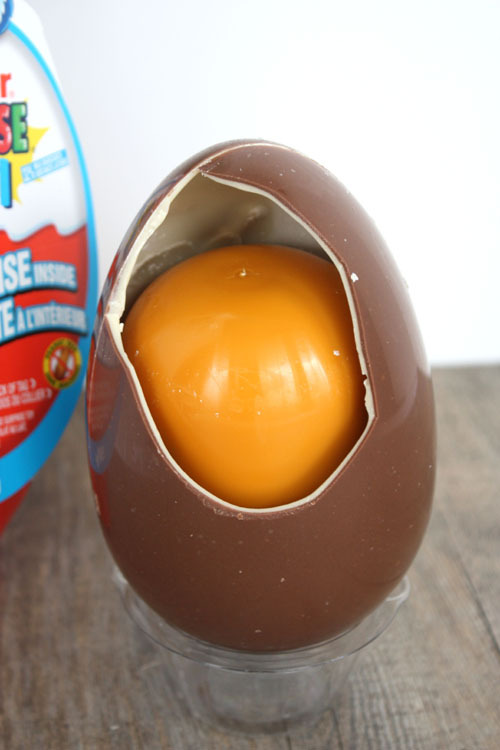 The egg itself came in a clamshell plastic holder and looks just like a regular size Kinder Surprise, with the seam and everything. The chocolate was a bit shinier and snappier than normal, much like the Kinder Santas. Here is the capsule next to a regular sized capsule. For a Kinder Surprise enthusiast like myself this is a silly thrill. 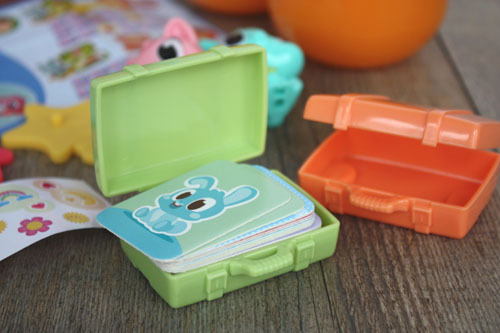 Inside the first giant egg was an adorable memory game with characters and luggage. The two suitcases actually open and hold the cards. The suitcases don’t snap shut though, which is a shame since I’d totally use them to store a little travel sewing kit or something. The second giant egg held this fishing game. That blue pool is made to hold water, so the boats would be floating. I’m not sure if this is a game of speed? There weren’t any game rules included in the assembly instructions. I like the idea of lions fishing for human boats, it’s a bit sinister. 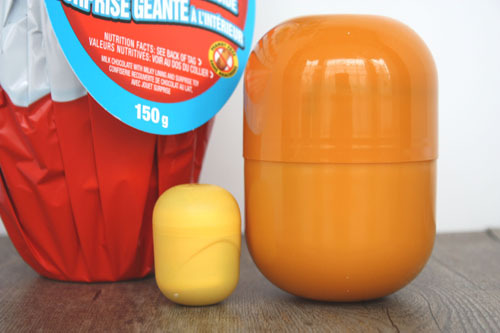 If you’re a Kinder Surprise nerd you might like to know that, yes, even the giant capsules come in different colors. Did you find these in Seattle? Where oh where? This is awesome! I love big versions of small things and mini versions of big things so this is great. And cute surprises too! Oh and a question.. What do you do with all of the capsules and toys? Woah, where did you find those? I definitely want one! I have loved Kinder eggs since a family vacation to Italy when I was nine, but I rarely see them in the states. AllisonA and Jessica – All I can tell you is that these came from a chain store in Vancouver, BC. Hana – I display the toys on my office shelf, the capsules will go towards something, probably storing rubber bands in my desk drawer. heather – Sure, I bought these at Relish, a specialty food/wine/candy shop in Mount Baker. I love that store, and they have a variety of imported candy including Cadbury Buttons, Kinder Hippos and the like. Also, some nostalgic candies. I’m amused that the pool in the fishing game is identical to the pool in the giant kinder egg I described to you in my comment in the kinder santa post. 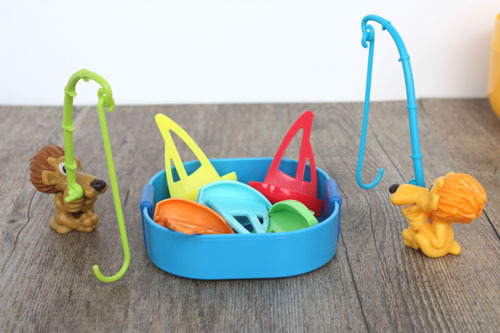 I wonder how many different pool based games the toy designers came up with? Jen – Ah, no way! I thought of the thing you described but didn’t imagine that part of it was the same. I haven’t checked to see if this one holds water for any amount of time but I wouldn’t be surprised if it was watertight for a while. I wonder what the pool thing might be as well. Absolutely amazing. I’ve been obsessed with Kinder Eggs since my first trip to London in 2003. Oh, I wonder if the giant eggs are big enough to generally be deemed “not a choking hazard” (which is what I’ve been told is why Kinder Surprise is not sold in the US). 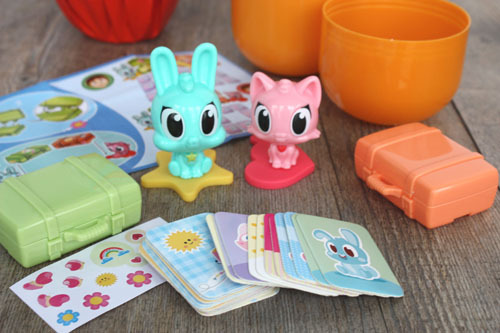 I’m 45 and would totally buy myself a kinder surprise egg, like every week, as a treat, if only they sold them here. Seeing this made my day. 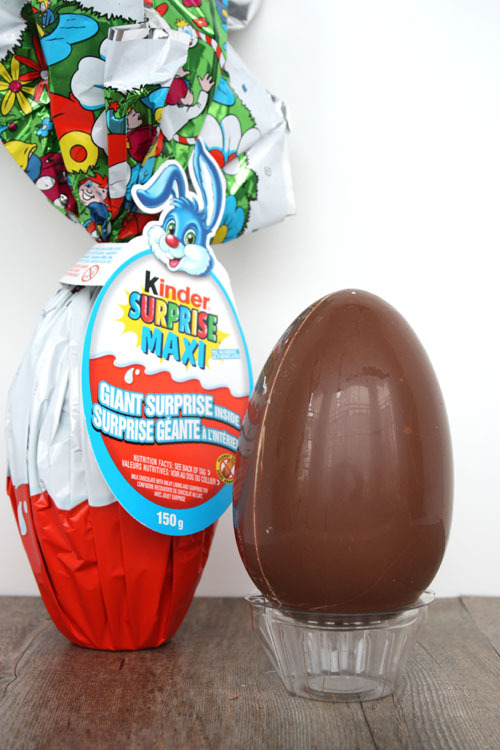 I also wouldn’t mind a Giant Kinder Egg filled with regular size Kinder Eggs. Must get to Canada this summer! Megan, I just wanted to let you know that I was so engrossed with reading this post and looking at the pictures that I actually missed my bus stop on the way home from work this evening! I have never done that before – felt very foolish but it was totally worth it. Happy Easter! oh man! I just about pee’ed my pants when I first read this and began a mad search in hopes of finding one again in the US, only to return back to the comments and read that they’re STILL not available. Boo hiss. I had never heard of Kinder eggs until I came across your post. I was super excited and immediately went online to seek them out, especially since I had not seem them in Georgia before. So, I was quickly disappointed when I read on the Wikipedia page that they were ILLEGAL in the US because of a law that the FDA came up with in the 1930s. Someone petitioned that they become legal back in 2012, but did not have enough signatures. I would love to try to get that ball rolling again. These things are awesome, so cute and adorable. Ashlea – Oh no! I’m so sorry, I was being coy in the text about just where these babies might have come from because I’m paranoid. I mean, they are actually watching. Diana – We survive somehow. I will say that due to amazing benefactors we were able to introduce some intact eggs to our niece and nephews this year and they were very well received and I therefore feel like I’ve introduced the next generation to just how cool these are. Shauntabia – My apologies, I should always include a little link to explain what these are and why they are not known in the US. They are really fun and on any rare occasion when I’m outside of the US I find and open them. I will admit, though, that I’m aware of how the current scarcity makes them special and how much the US marketing machine might make the toys inside less than interesting. I will have to investigate to see if anybody has tracked Happy Meal toys over the years to see how marketing has or has not helped the appeal. I can say that from my own very small observations the branded toys inside eggs were the least engaging. So, there is a small part of me that roots for them continuing to be a non-US treat. Here in Canada we actually have another size. There’s regular, mini, ‘big’ and maxi. I was totally hoping the maxi one was going to be filled with a million mini toys, though! I have a ‘big’ one left over from Xmas stockings. I’ll snap a photo tomorrow. 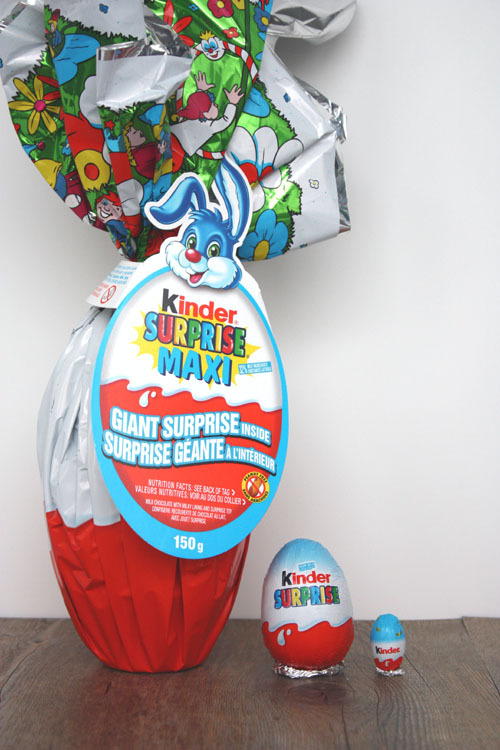 Ailidh – I had no idea there were Big sized Kinder Surprise as well. I clearly have to make more trips up to find them. I think they are just importing more (they are German) or possibly making more / bigger just to mess with us. I found the ‘big’ ones in staples in Dec whike I was Xmas shopping. I was like, “what?! 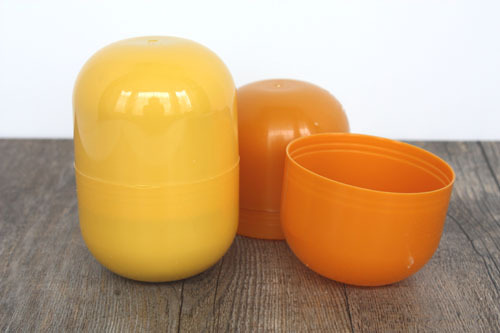 Big kinder eggs? !” Naturally I scooped some up (stocking stuffer par excellence) and the cashier was similarly surprised / agog. FWIW, all the chocolates made by the kinder people are reliably good, but if you can get your hands on a kinder bueno, those are pretty well the best. No toy involved, though. I’ll investigate! Thanks so much for the update.